This fusion of Infrared sauna and isometric, yoga style poses has proven to be a must have for health clubs and their members. Hot Box Detox (HBX) is the latest innovation from Planet Beach Franchising Corporation and is best described as "Beyond Hot Yoga." A virtual instructor hosts this three-person infrared sauna unit with limitless video scheduling configurations. It is shipped to your location, installed and followed up with ongoing support by a dedicated HBX representative. 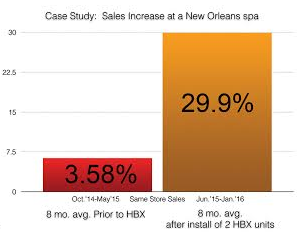 Substantial opportunity for retail revenue is also a plus with the HBX companion products that consumers can't get enough of. The benefits of infrared light therapy are widely recognized in the health and wellness industry. Some of the advantages include skin purification, reduced blood pressure, pain relief, improved circulation and collagen repair. Combined with the sequence of body postures your health club members can improve workout recovery time, strengthen muscle and bone while burning massive calories and flushing toxins from their bodies.